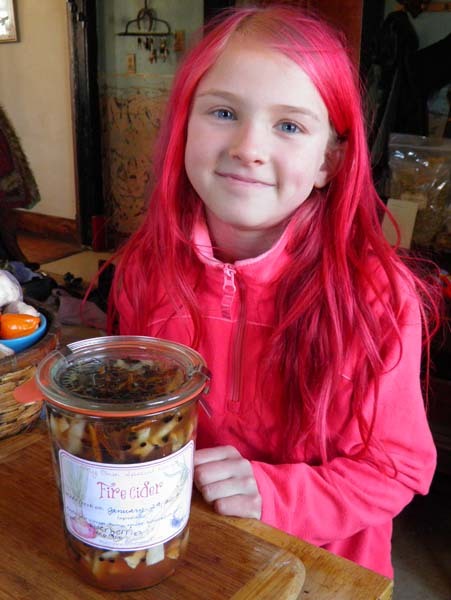 Looking for a simple herbal project to do with your kids? 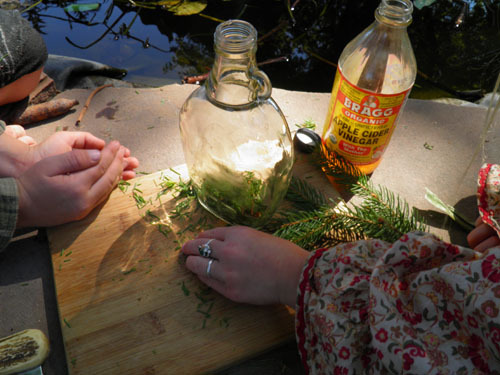 How about making some herbal vinegars? For those of us in the northern hemisphere, this is a great time of the year to make vinegars as we have lots of herbs in abundance right now. There are many reasons for making and using herbal vinegars. Typically, apple cider vinegar is used which has a lot of healing properties itself. Vinegar helps to build strong bones, improves skin tone, lowers cholesterol, and much more. Vinegar is great at extracting minerals from plant materials, something water and alcohol isn’t always good at. Vinegars are versatile in their use too. They can be applied externally to sunburns and fungi for soothing relief. Internally, vinegars can be added to a glass of water for a refreshing healthful drink, combined with an herbal syrup to make shrub (how to can be found in the Blackberry issue), combined with herbal infused oils to make salad dressing, and sprinkled on beans and grains. We can use leaves, flowers, roots and seeds for making vinegars, though they should be harvested in season. Roots are best harvested in the spring or fall, leaves before the plant flowers (or after if it is an early blooming plant) and flowers right as they open. 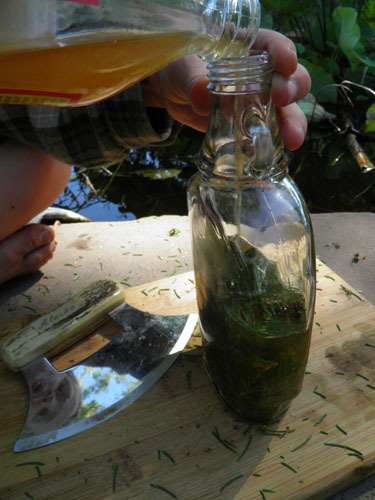 Herbal vinegars are easy to make, making them a great project to do with kids. Letting kids make their own vinegars from their chosen plants empowers them to take control of their health. Kids who make their own herbal remedies are more likely to want to use their own herbal remedies. Chop up the herbs you are using. You can make a simple (a single herb in vinegar) or blend a few herbs together. Simples are more versatile and can be blended later to make more elaborate vinegars but combinations are wonderful too (see the note of fire cider at the end of this article). Chopping needles and adding to the bottle. Fill your jar half to 3/4 full of chopped up herbs. Pour the vinegar to fill the jar to the top, leaving 1/2 inch air space. Adding vinegar to the bottle. Place a piece of waxed paper over the top of the jar, then screw the lid on. The waxed paper will prevent the vinegar from corroding the lid if it is metal (you can omit the waxed paper if your lid is plastic). 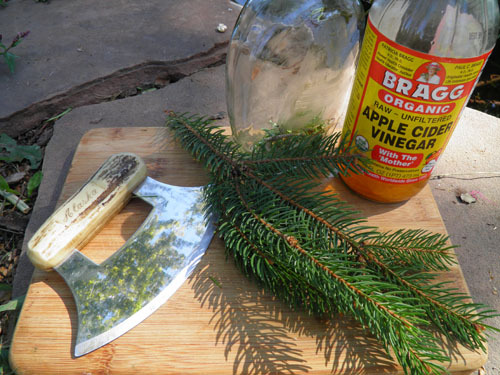 Label your vinegar and set aside for 4 – 6 weeks, out of direct sunlight. The pickled herbs can be chopped and added to salads or eaten straight when it comes time to strain them off. We find it easiest to just leave the pickled herbs in the vinegar and eat them as we want, using the vinegar as needed, until the jar is empty. 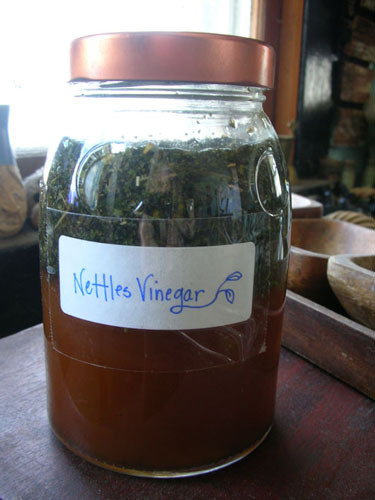 Your herbal vinegars should last indefinitely, they are well preserved but will be most potent in the first year of use. 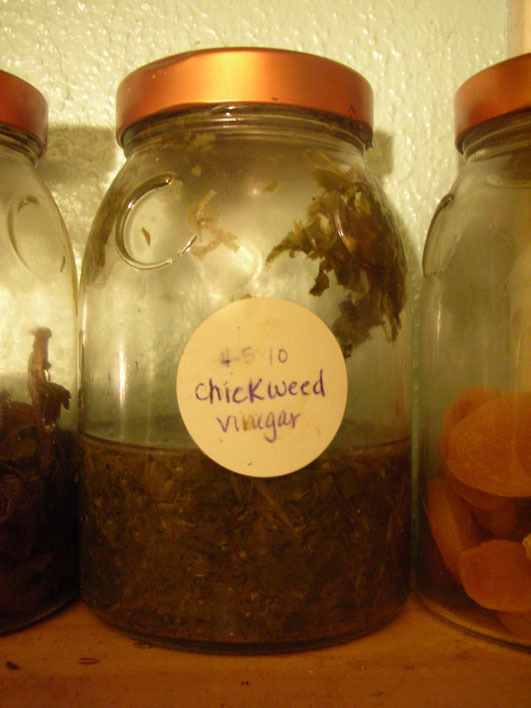 Many herbs can be added to vinegars. Herbs that have lots of minerals work well, as do aromatic herbs. This is a short list of possibilities. Fire cider, it’s so easy, anyone can make it! Don’t forget about fire cider! Fire cider should be the staple in every home for winter health! 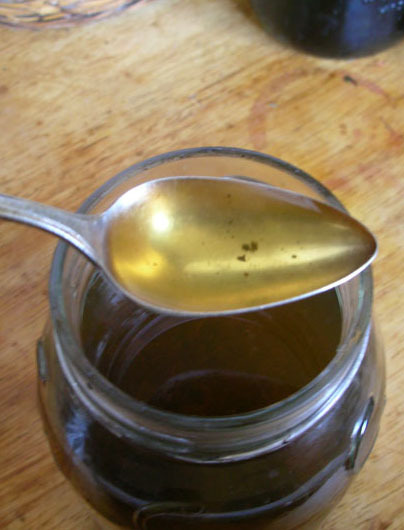 A combination of Apple cider vinegar, honey, Garlic, Onion, Cayenne, Horseradish and other herbs, this traditional herbal recipe was brought to popularity by herbalist Rosemary Gladstar many, many years ago. For more info on the benefits of fire cider and how to make your own, download our free fire cider ebook. For a more in depth look, you may choose to purchase the ebook with corresponding Herbal Roots zine issues. Do you use herbal vinegars? What are your favorites? 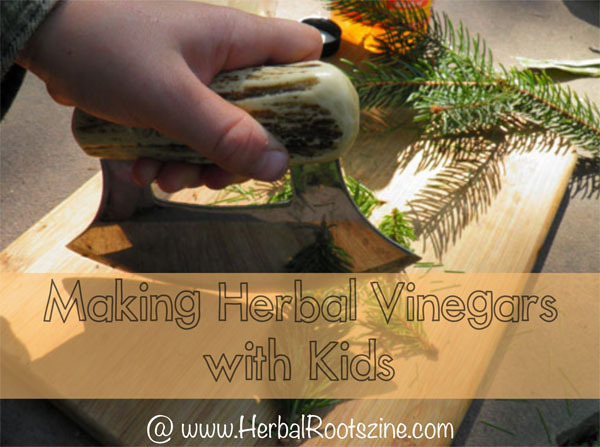 Do your kids like making and using herbal vinegars? Tell us about your experiences with herbal vinegars in the comments. This entry was written on July 23rd, 2015 by KristineBrown and filed under Uncategorized.